(St. Petersburg, Fla., April 2, 2018) - Eleven years is a long time to hold on to a dream. And when it finally came true for Marcus Walden, he wanted to take a moment to think about all the bus rides and hotels, the four organizations that gave up on him, the others that never wanted him and that night when his wife talked him out of quitting altogether. It was a lot to cram into 10 seconds. 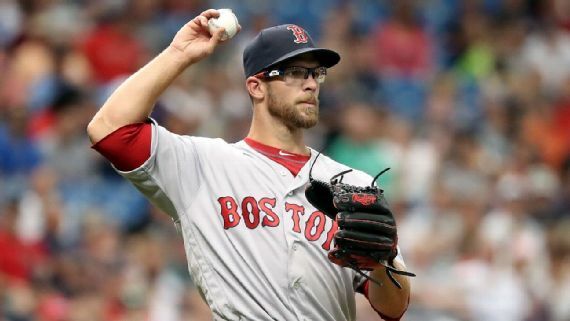 So, as Walden got to the mound to make his major league debut in the sixth inning Sunday at Tropicana Field, he simply accepted the ball from Boston Red Sox manager Alex Cora, took a few deep breaths and said a prayer that he's been saying for most of his life. Then, the 29-year-old right-hander set about the business of trying to protect a one-run lead in the finale of a four-game series against the Tampa Bay Rays. "I was nervous, obviously, warming up," Walden said after the Red Sox won 2-1, their third consecutive one-run victory. "But once I got out there, I felt pretty good." It didn't start off so hot. Walden's second pitch was a belt-high, 92 mph fastball, and Joey Wendle stroked it for a double. But with the tying run on third base and the go-ahead run on second, Walden threw a first-pitch strike to Wilson Ramos, then got him to hit an easy fly ball to right fielder Mookie Betts. Walden went back out for the seventh inning and needed just 10 pitches to retire Mallex Smith, Adeiny Hechavarria and Denard Span. The whole thing would have seemed so easy if not for Walden's having to glove Hechavarria's line-drive comebacker that only made his heart beat more rapidly than it already was. "It hit me right in the glove, honestly," Walden said. "I'm just glad it wasn't right at me. I would've got handcuffed." Regardless, Walden was a long way from Lancaster, Pennsylvania, where he spent five months in 2015 playing for former Red Sox manager Butch Hobson in the independent Atlantic League. He got released early in the season after bouncing from the Toronto Blue Jays to the Oakland Athletics to the Cincinnati Reds in the previous 12 months and was discouraged to find that no major league organization wished to take a flier on him. Walden already survived Tommy John elbow surgery in 2010. He overcame the disappointment of getting called up by the Toronto Blue Jays early in the 2014 season only to get sent back to Triple-A without appearing in a game. But there he was, with his pregnant wife at home in California, sitting in a hotel room and contemplating a new career. "I enjoyed playing when I was in independent ball, but it was something that, financially, that's a grind," Walden said the other day. "I played seven years on a minor league salary. I got called up with Toronto, and the next year, I was making independent-ball money. Financially, when you've got a kid on the way, it was tough." Walden told his wife, Nichole, that he would go back to school or look for another job. "She told me, 'Not a chance,'" Walden said. "The last three or four years, that's what kept me going." Walden finished the 2015 season in Lancaster and played winter ball in Venezuela. He traveled home before and after the birth of his daughter, Sutton. And he signed a minor league contract with the Minnesota Twins for the 2016 season. After posting a 2.54 ERA in 36 relief appearances for Triple-A Rochester, he signed a minor league deal with the Red Sox and went 10-6 with a 3.92 ERA for Triple-A Pawtucket last year. The Red Sox invited Walden to major league camp even though he wasn’t on the 40-man roster. He allowed one earned run on six hits and struck out 16 batters in 14 innings over eight appearances. And on the second-to-last day of spring training, Cora told him he had made the team. "Tears of joy," Walden said of his reaction. Walden didn’t pitch in the season’s first three games, but before he left for the ballpark Sunday, he told Nichole and Sutton that this might finally be the day. Right-hander Heath Hembree threw 21 pitches the night before, and closer Craig Kimbrel was unavailable after saving back-to-back games, pushing Matt Barnes and hard-throwing Joe Kelly into eighth- or ninth-inning roles. "I thought I'd be the first guy up, and it worked out,” Walden said. “I think I did pretty good." Tough to get much better, actually. Nichole and Sutton were in the stands at Tropicana Field and left quickly after the game to catch a flight to Miami. If Walden pitches against the Marlins this week, they won't miss it. Until then, there will be plenty of time for Walden to relive his dream and replay in his mind the 11 years it took to turn it into a reality. "A lot of bus rides," Walden said with a smile. "But definitely, being able to be considered a big leaguer now and have that day be yours, it's a honor."